RF technology is simple, robust and reliable. RF is often used in reference libraries and more commonly in retail environments. 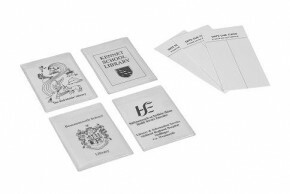 We fully support all labels and hold a wide range of label stock including pockets and C-Cards. We can also supply RF accessories and support. D-Tech can supply C-Pocket and C-Cards (Polypockets – datedue cards). We deliver various designs and delivery is within two weeks of order. Call us today for a competitive price on all your RF label needs. D-Tech RF Security systems are modern and stylish. The system can be ordered in different colours and detection levels are over 90%. The antenna can be set at 1.8m between centres. The following frequencies are available 8.2Mhz / 9.5Mhz / 10.0Mhz /10.5Mhz. Compatible with Checkpoint™ security systems.